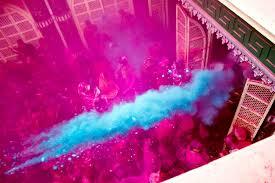 Holi, the festival of colours which is celebrated in India is traditionally known as Holika. The famous legend of Hiranyakashyapu is the reason behind the celebration. Vasanta Mahotsava, Kamotsava or Madanotsava are the other names of the festival attributed due to the legend of Shiva and Kamadeva. The festival is also known as Shimaga in Maharashtra, Dolayatra in north India, Kamadahana is south India and Hutashani Mahotsava. Celebrations begin from the full moon day of the month Phalgun to the next five days which varies from place to place. The main celebration of bonfire is on the full moon day in the month of Phalgun which comes in the month of March or April according to Gregorian calendar. 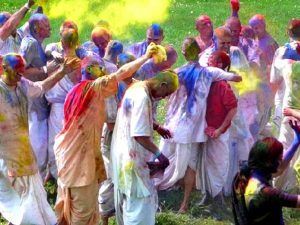 People enjoy themselves playing with several colours the next day till the fifth day of the festival in various forms. Festival day, Phalguna purnima is the last day of the year and brings in good luck of the Vasanta ritu (beginning of spring from next day). Vasanta Mahotsava is another name of the festival. Hence, this two day celebrations have twin purposes. One, at the end of the year all bad and unwanted things in our life and mind should be rejected. This is symbolized by the bonfire. And secondly, to welcome the spring season which is celebrated by playing colours as spring is a colourful season. Thus, the festival is also known as Vasanta Mahotsava (festival of spring). Some scholars state that the festival of Holi is the manifestation of traditional fire worship. The famous legend of Holi festival is that king Hiranyakashyap wanted everybody in his kingdom to accept his sovereignty in the world. His son, Prahlad a keen devotee of Lord Naarayana was not ready to accept the dominance of King Hiranyakashyap. So Hiaranyakashyap commanded his sister, Holika to enter a blazing fire with Prahlad in her lap. She had a boon whereby she could enter fire without any damage to herself. But she was not aware that the boon works only when she entered the fire alone. As a result she paid a price for her brother’s desires, while Prahlad was saved by the grace of god for his devotion. Therefore the festival is celebrated as the victory of good over evil which is mentioned in Narad Purana. Story in Bhavishyapurana states, ‘demoness Dhundha or Dhaundha was troubling the children in the village. Hence people drove her away by lighting fire’. Similar type of legend is, Kansa, the king of Mathura sent Putana demon to kill infant Krishna. Krishna killed her by sucking all the blood from her body. Then people from Gokul burnt her. Since it is also celebrated as the ‘greeting of spring’ we find evidence related to Lord Krishna. Lord Krishna Who played colour festival in Gokul with his beloved Radha and other Gopis is also given as the reason for the tradition of playing colours. On the day of Holi Lord Shiva destroyed Kamadeva, the god of love, by fire for his misbehaviour of ‘shooting his love arrow on Lord Shiva to break his meditation and evoke his interest in worldly affairs’. Later Shiva blessed him to take the form of Vasanta (spring season) pleased with his apology and praise of his wife Rati. Hence festival is also known by various names such as Kamotsava, Madanotsava (Madana is epithet of Kamadeva), Vasantotsava. In Bengal and Orissa, Holi Purnima is also celebrated as the birthday of well-known saint Shri Chaitanya Mahaprabhu (A.D. 1486-1533). Earliest record about the festival goes back to Jaimini’s Purvamimamsa Sutras and Kathaka Grhya Sutras which gives the description of the festival. ‘Ratnavali’ by Harsh, Dashakumar Charit of Dandi and Garud Puran states a delightful description of Holi as a festival. A stone inscription found at Ramgarh in the province of Vindhya has mention of Holikotsav on it. It belongs to 300 BC. We also find references in the sculptures on walls of old temples. A panel sculpted in a temple at Hampi, capital of Vijayanagar belonging to 16th century, shows a cheerful scene of Holi. Ahmednagar painting of 16th century shows a royal couple sitting on a grand swing, while maidens are playing music and spraying colors with pichkaris. Several other paintings and murals in the temples of medieval India provide a pictorial description of Holi. The festival is celebrated for two days; first day with bonfire and second day with colour playing. All over India the festival is celebrated with great enthusiasm and excitement. In Maharashtra and Gujarat too Holi is celebrated with lot of enthusiasm and fun as mentioned above. There is not much variation from the original tradition. It is celebrated with so much charm in Mathura, Vrindavan, Barsana and Nandgaon, the places associated with the birth and childhood of Lord Krishna. At Barsana Holi has the name of Lathmaar Holi. Women of Barsana give a tough time to men of Nandgaon as they come to play Holi with them. Women drag the unlucky captives, beat them, dress them in female attire. So far all is in the spirit of Holi. It may be noted that in some places like Bihar and UP Holika Dahan is also known as ‘Samvatsar Dahan’. Tradition of worshiping Kaamadeva takes place mainly in south India. People have faith in the legend which tells about the great sacrifice of Kaamadeva. Hence the festival is also known as Kamadahana, Kamotsava and Madanotsava. In the north east, Manipuris celebrate the festival in a colourful manner for six continuous days. Here, the centuries old Yaosang Festival of Manipur is combined with Holi with the introduction of Vaishnavism in the eighteenth century. The highlight of the festival is a special Manipuri dance, called ‘Thabal Chongba’. In Bengal, on the festival day morning Lord Krishna is worshiped then in the evening that of fire. They burn a human figure made of grass as the symbol of bad and evil related to human nature. In Orissa, mainly Dolayatra is performed; it is a rally of Lord Krishna in palanquin. Similar Dolayatra is performed in Bengal also. Holi festival is celebrated by the all classes of society. Poor, rich and people from all castes celebrate it with joy. It helps to bring the society together and make it stronger. Imagine after a game of Holi your skin begins to glow and your hair get an added bounce or lustre… Most people cannot imagine this scenario as for a large majority of us it is nearly a nightmarish experience to get rid of the colours and to get their initial skin type back. The festival is celebrated for the farewell of the Shishir rutu (winter) which is the period of shedding of leaves. Hence much natural garbage accumulates in this period. So festival is celebrated for the disposal of that natural garbage. When Holi is burnt, high temperature kills the bacteria in and around the body while performing tradition of going around the fire. ” Mahadeva Shastri Joshi. 1979. Bharatiya Sanskruti Kosha, Vol. X. Pune. Bharatiya Sanskrutikosh Mandal. ” Sharma Brijendra Nath. 1978. Festivals of India. New Delhi. Abhinav Publishers. ” Bapat Tara. 1991. Rituals and Festivals of India. Mumbai. Popular Prakashan. ” Shastri Ravidatta. 1994. Dharmasindhu (with translation). Delhi. Choukhamba Sanskrit Pratishthan. ” Sharma Mihirachandra. 1952. Nirnayasindhu. Lakhnow. Tejkumar Press.